In a future where an autonomous system tracks everyone's mental state at all times and crime has all but been eliminated, a squad of police discover that an experimental prison may be hiding more than just the specifics of its new rehabilitation treatment. Following two seasons of the TV anime and a theatrical film, Psycho-Pass: Sinners of the System is a trilogy of one hour films. Instead of being connected into an overarching plot, each one focuses on its own stand-alone story that is both a captivating mystery and a tool for greater exploration of the characters we have been introduced to in the previous works. The first of these, Case.1 Crime and Punishment, premiered at the Tokyo International Film Festival this past week and we were on hand to watch it. *Note, by necessity, this review contains spoilers for Psycho-Pass ' first and second seasons as well as the first theatrical film. The Psycho-Pass series in general is set nearly a hundred years in the future. In this futuristic, cyberpunk world, Japan has adopted the “Sybil System”--a computerized system that constantly scans the brains of the population to ensure mental health. This results in each person having what's known as a “crime coefficient”--a number showing if your mental state would allow you to knowingly commit a crime. Anything under 100 is normal. Between 100 and 300 lists you as a “latent criminal” and you will be incarcerated--permanently, if therapy and medication have no effect. Over 300 means you are a candidate for on-the-spot summary execution. While this has led to a seeming utopia with a staggeringly low crime rate, there are still the occasional violent criminals. However, catching a criminal involves thinking like one--which almost guarantees that police will become latent criminals themselves over time. Thus the police investigators are aided by “enforcers”--latent criminals who do the dirty work that would negatively affect the psyche of normal police. 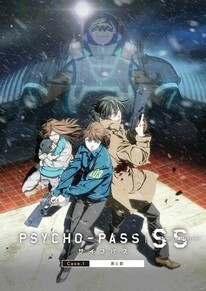 Psycho-Pass follows one such team of investigators and enforcers as shown through the eyes of young inspector Akane Tsunemori. Crime and Punishment picks up around six months after the events of the movie. Things have more or less returned to normal when a strange latent criminal surrenders mid-psychotic break. While it is quickly apparent that some sort of drug has altered the woman's state of mind, Akane's team is suddenly forced by orders from above to give the woman up and return her to a special experimental prison--the very one this woman used to be a therapist at. Knowing that something is off, Akane wants to take her team and inspect the prison. Unfortunately, that's easier said than done. Due to the events of both seasons of the anime, Akane holds a special place in regards to the system. She is one of only two police who knows the secret of the Sybil System--that it's able to identify criminal minds because part of it is literally made up of preserved criminal brains. She also knows that it is far from perfect. In the world of Psycho-Pass , Akane is the answer to the question “who watches the watchers?” Even though the system can judge itself after the events of season two, it still recognizes that a viewpoint outside its own is needed. Akane is perfect for the role because she believes the system is inherently flawed. However, she also knows that bringing it down would cause irreparable harm to the normal population. And without a better system to replace it, she is reluctantly willing to let it continue. While this means Akane is able to directly confront the Sybil System when it does something questionable, it also means there is always the looming threat that Akane will deem the system unsalvageable and attempt to bring it down. Thus, it is dangerous for her to do things that may cause the impression that she's gone rogue--like leaving the Sybil System's seat of power in Tokyo on a whim. To play it safe, Akane instead dispatches fellow inspector Mika Shimotsuki along with two enforcers, Ginoza and Kunizuka, to investigate the prison while she and the rest of the team cover the Tokyo end of things. The prison expands the world of Psycho-Pass even as it serves as character development for the Sybil System itself. While we, the viewer, see the Sybil System as a looming antagonist, it thinks itself a force for good. It is supposed to care for the people and make a world for them where they get a peaceful life. While this has been more or less achieved for normal people, there is still the issue of latent criminals--especially those who have done nothing wrong. Thus the system is constantly looking for new treatments. Through a new combination of drugs, therapy, and work, the prison has produced a different kind of society where the latent criminal prisoners act completely in harmony with one another--keeping their criminal coefficients under 90 in most cases. At the same time, the prisoners are doing work valuable to society at large. And as the Sybil System cares far more for results than the means needed to get those results, the prison has a large degree of autonomy. However, that doesn't mean that everything is on the up and up--as Mika discovers during her investigation. Though the film makes sure to point out Akane and the Sybil System's roles in both the narrative and greater world at large, the main focus is a deep dive into what kind of person Mika is after the events of Psycho-Pass 2 . Mika is, by and large, the anti-Akane as far as the story is concerned. While Akane's morality mirrors our own, Kana is a fully indoctrinated member of society under the Sybil System—i.e., she believes in the system fully. She finds nothing wrong with killing anyone marked as a criminal or latent criminal--and doing so doesn't affect her crime coefficient at all. While Akane would try to talk criminals down, lowering them below the 300 threshold and thus save their lives, Mika will just shoot--or order her own enforcers to do so. Mika, like Akane knows the secret of the Sybil System, but because she believes the system is infallible, she is willing and able to twist her own beliefs to fit it. However, in Crime and Punishment, we see this goes both ways: she also has the ability to twist the system itself into a framework that suits her beliefs. Though they are still latent criminals, it's clear that Mika has at least come to view her enforcers as people on some level (though obviously lesser people when compared to her). She would never abandon them--much less kill them meaninglessly--and trusts them with her life. But it is Mika's interactions with the drugged former therapist that really show her growth. At first, Mika sees the woman as just a criminal worthy of being killed off without a thought. However, as the mystery unfolds and secrets are revealed, Mika begins looking for reasons to save the woman. And the moment Mika finds a motivation inside the woman that she can identify with, everything changes. While she would never attempt to do so normally, if Mika can understand a latent criminal's motivations--and finds them truly noble--they become people again in her eyes. If this happens, she will fight alongside and even protect them. And to Mika, there is no higher motivation than the love that drives you to protect those you care about. After all, that's what the Sybil System is supposed to do: protect. So in the end, while Mika still believes the system is infallible she recognizes that it is trying to evolve--that it is possible for it to make itself less perfect. And that is something she cannot condone. On the presentation side of things, Crime and Punishment looks great--easily on par with both the TV anime and the movie. The music likewise continues to fit the action and futuristic setting. It is also bookended with remixes of past Psycho-Pass theme songs, which is a nice little treat. But as good as it is, the film does have a few problems, namely in the action department. One of the most important things to remember when writing a story like Psycho-Pass is to keep it grounded in reality. The human characters must be human--and thus relatively frail. Narrative tension remains high throughout the story due to the sense of danger constantly surrounding our heroes. However, in the big action climax, Crime and Punishment fails in this department. Being punched by a giant exosuit so hard it throws you across the room? You should be dead. Fall 10 stories onto a steel floor? I don't care how powerful your robotic arm is, you should be dead. One specific character should be dead so many times over, it is laughable. It is so ridiculous compared to all we've seen before that it pulls you right out of the story the moment you become aware of it. The other issue the story has is that it expects you to remember minor-seeming details about how the technology in Psycho-Pass works. While this was covered in the series, Crime and Punishment makes no effort to remind the viewer of these details--even though they are vital to the story making sense. There is no hand-holding here so if you haven't seen Psycho-Pass and its sequel recently, you may want to give it a rewatch before diving into this film. For fans of Psycho-Pass , Crime and Punishment is an excellent stand-alone mystery. It fleshes out the world, showing what things are like outside of Tokyo in Japan and gives us a tantalizing glimpse of how our heroes have been changed by the events of the second season and film. But more than anything it is a story about Mika coming into her own and coming to see the world differently than she ever has before. Psycho-Pass: Sinners of the System -- Case.1 Crime and Punishment will be released in Japanese theaters on January 15, 2019. There is currently no word on a Western release. + An interesting, in-depth look at Mika after the events of Psycho Pass 2. − Action scenes that are so over-the-top they are comical given the supposedly realistic nature of the world.